This course seeks to systematically outline and guide you through, some of the fundamental principles that lead to a comprehensive proficiency for drawing the human figure. In the space of seven weeks, it summarises skills that could be repetitiously applied in a three to five year life drawing course; thus giving the student the necessary tools in a short time, to build on principles they can practice and repeat over a life time. 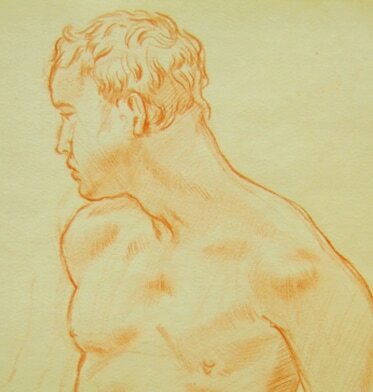 The course also lays a strong emphasis on learning from the drawings of the Old Masters. Students will be assigned a weekly drawing(s) to copy that relates to a specific principle studied during class. Furthermore, the life model’s pose - and where necessary lighting - will be set up to mirror the action in a drawing studied, in order to further aid the student in conceptualising its principles in the empirically observed figure. Week 1. Luca Cambiaso (1527 – 1585) – the figure as basic line and structure. Week 2. Luca Cambiaso (1527 – 1585) – the figure as line and structure. Week 7. Andrea Sacchi (1599 – 1661) - The figure as convexed forms, basic shadow masses and modelling at the plane break. The ability to apply a basic knowledge of human anatomy to figure drawing, including the basic skeletal masses of the figure and muscle groups. Either charcoal, H, HB, B pencil, oil based hard red or black chalk pencil.